You can listen to a special HOLYness BIBLEs for the blind song that we feel compliments these “Nigeria Letters of Thanks” by clicking the button below. This song will take approximately 4 minutes to play. i am very happy to write you this day and also thank you for the bible you sent to me through evangelist Ify. Sir, over here in Nigeria many ministries are after money and tithes and riches they are not after equipping people with bibles. If you dont have a bible and you come to church that is not there own concern. If you had not sent me a bible, i would be without a bible to read Gods word. Thank you very much. May the Lord bless you beyond your reach amen in Jesus name. Thank you for the copy of the bible you sent to me. brother ify gave me the bible it was loaded with messages that are vital to my spiritual growth and those I share the Gospel with. I believe that it is an accurate and timely tool for this generation, especially in these end times. I am proud to read my bible daily and share with others the daily truth in the word of God. Brother if it was not for you I would have never owned a bible now. thank you very much. I appreciate you all so much. I want to thank you very much for the bibles you sent to me through brother Ify. Thank you very much! I am happy brother Ify gave me your address and I am happy to testify to you how I came to the Lord. It was when I saw brother Ify’s life changed and he started telling me of God’s saving grace and the love of Christ that I too gave my whole life to Christ and received him as my savior. I am the happiest person on earth today because I am now closer to Jesus with my bible. Words cannot express to you how happy I am because of the bible you sent to me through evangelist Ify. I was a smoker, cheater, and humanizer before I gave my life to Christ last year and ever since then I promised to follow Jesus. Thank you very much for the bibles. May the Lord bless you and may we all meet in heaven Amen. I am writing to report receipt of the fine beautiful bible you sent to me and that was handed over to me by brother ify I am so thankful and it is useful personally to me as a born again and for the Christian Life College and entire church membership as I can read English bible . God bless and multiply the people who support you financially. Words cannot express to you how happy I am. I was a smoker before I gave my life to Christ last year and ever since then I promised to follow Jesus but I had no bible. Calvary greetings to you in Jesus name. 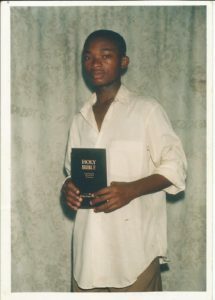 My name is D. O. I collected your Email address from brother Ify whom you sent bibles to some months ago. I do not know how to thank you for the beautiful bibles which you made possible to reach me. I am so happy. 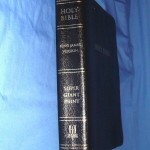 At first I believed I would never own a bible but these bible reached me through brother Ify. I am writing this day to say thank you in a very big way with all my heart. thank you evangelist. God will bless you. Thank you for sending me a bible through brother ify. It has been of a great help to me and my Christian life as a whole. It has helped me in my prayers as well as my devotion to God. It has helped my friends as well as I pass on every newsletter I finish reading. my bibles I am always grateful and I hope this wonderful friendship with your kind ministry continues always. I bless the name of the Lord because of you and the ministry the lord has called you to do. Your reward will be in billion folds both here on Earth, and in heaven. I am very, very happy because of the bibles you sent to me through an evangelist called ify. This is a true evangelist. Many of like him are very, very scarce here in Nigeria. Brethren, the main reason I am sending you this Email is to thank you immensely from my whole heart for the bible you sent to me. please pass this email to your congregations to read. Tell them I thank them all. May the Lord bless you beyond your imagination Amen. the fine bible you sent to me through one of our dearest evangelist called ify has blessed my life as i start to read my bible daily. Thank you very much from the bottom of my heart. i assure you that your reward will be in billion fold both here on earth and in heaven. the grace and peace of Christ be with you. I am glad to write you this day to let you know that your tracts booklets and the bible you sent has built up my faith and work for the Lord. I have been desiring to have a copy but I did not believe I can have one but much thanks to your ministry. I have been Reading and learning from the bible and I find that God’s word is inspiring, refreshing, and educative it points to the whole truth of life. Please keep spreading this truth. This is the kind of message and work we need in this end time here in Nigeria. May the Lord bless your ministry in every way Amen. With a joyful heart I am writing you. One of our evangelist called brother Ify presented the beautiful bible you sent to me. I want to say a big thank you. Sincerely you have given me the greatest gift of my life. I appreciate it and I will cherish it so much all the days of my life. May you and all who contributed toward sending the bibles be blessed. PEACE OF CHRIST BE WITH YOU ALL. I GOT YOUR ADDRESS FROM brother Ify. MY MAIN REASON I AM WRITING IS TO THANK YOU SO MUCH FOR THE BIBLES YOU SENT TO us. I WAS AMONG THOSE THAT RECEIVED FROM THE Bibles YOU SENT AND I AM FILLED WITH JOY. My name is J. N. and brother Ify gave your web site Email address to me. I am an 18 year old girl. I gave my life to Christ after I went to a crusade and there I received Jesus into my life. I have received the bible you sent to me through one of our pastor that I know that is sent by God to help believers called pastor ify. The bible has been a tool that God has used to transform me to become a useful instrument in His house ever since I have been reading it. I can now see Articles in the bible that are timely and anointed. I have followed them and they have equipped me and I am equipping others. God has called me as a teacher in His body. Please do pray for me. May the glory of God rest on you and your ministry until Christ’s return. My name is M. A. I don’t know how to thank you for the greatest gift you gave to me through brother Ify. I mean the HOLY BIBLE. I am so excited and full of joy. Thank you very much. I have been reading my Bible daily since then. God will bless you because of this in Jesus name Amen, and Amen. Thanks and praise be to our Eternal Father who loves us daily in Jesus name. I hope this Email finds you doing well. My name is M. C.. I requested that brother Ify give me your Email address. I am among the 25 people that received from the bibles you sent to us through him. Why I requested for your Email address is because I wanted to send you an Email of thanks and tell you what you have done for my life. I had already given my life to Christ but I had no bible and my stand in Christ was not strong until I received the bible you sent and I started reading it daily. I now have fellowship with others going to church and attending church meetings because of this bible. My life has changed completely. I read my bible daily in church when we are asked to read any passage in the bible. I quickly jump up and I read it out each day that passes by. My faith in Christ becomes stronger and stronger daily. I can now use my bible to tell others about Christ. I am the happiest person. I am writing to say thank you very much. Thank you very much and I pray the Lord will bless you and your work. I pray that your good work will increase. Keep up the good work of building lives and equipping them. I love you. May the peace of Christ be with you all. Today I am the happiest person on Earth because I have completely decided to follow Jesus. I had almost gone back to my old life and way of living because I lacked a Bible to read or take to prayer meetings, but today I am filled with joy because of the Bible you send through brother Ify. I have been reading my Bible every day and I am gaining peace with God, and go to church regularly and participate in the activities. I also Tell others about Christ’s saving grace. I requested for your Email because I wanted to thank you. Pastor, thank you for the Bible. Thank you for not allowing me to go astray after I had given my life to Christ. Good morning to you. I collected your Email from brother Ify so, I could write you. I am pleased to Email you this morning. My main reason for writing you is to thank you very, very much for the bible you sent to me through brother Ify. It is the greatest gift I have ever received. I am just a widow, Jesus is my friend, and the bible you sent is my husband. Thank you again. Remain blessed. What a blessing and joy of the Lord to write you this beautiful day. I would like to say if all people could be given a bible to read and purely have knowledge from it then the door to the kingdom of God would be open for each and every individual. The bible you sent to me through one of the Christ’s evangelists and ambassadors called Ify has clearly helped me to know it is only through the bible we can have joy of the Lord and the true confidence in life. My life has completely transformed. As I read His Word each day I feel the presence of the Lord. Pastor, as if that is not enough from reading the bible I still learn that we should extend the message of Christ to others. John 3:16. Pastor, with all my humble heart I want to thank you, your ministry, and co workers. I pray that the Lord God of the poor like me, will not forsake you, but will bless you all abundantly. I want to thank you in a very special way for the good gift of the Bible you sent to me through one of our leaders named brother Ify. I just want to say thank you very much with much love. my prayers is that the lord God will bless you, your family, and ministry in Jesus name. with a deep joy in my heart that meditates and sends to you this email. i decided in my heart to take taxi from a 40 minute drive from my house to write you to thank you for the bible you sent to me through our good evangelist brother ify. since i received my own bible and start reading my bible my life has changed. brothers i am thanking you this day from my heart that i so much appreciate you so much may the lord bless you all. peace of the lord be with you all in Jesus name. i am thanking you for the beautiful bible that you sent to me by one of the good evangelist ify. May the Lord bless you. I grreet you in the Lord’s name, who is Lord and Savior Jesus Christ. On behalf of me and my family i wish to express our heart felt gratitude for the 4 bibles you sent to us many months ago through brother Ify. thank you very much and may God bless you and your ministry. We greet you in the name of our Lord and blessed savior Jesus Christ. we are very very happy to write you. 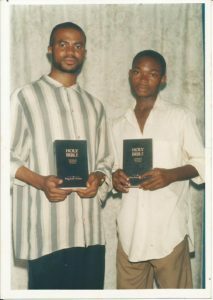 We both received bibles that you sent through brother Ify. He told us he was going to send you an Email of thanks for sending the shipment of Bibles. we quickly collected your Email address. So, today with joy in our hearts we are writing to say thank you very much for the beautiful bibles you sent to us. We really appreciate it. We are reading our bibles daily and we are also witnessing Christ to our neighbors. Brethren, thank you very much again for the bibles. May our Lord Jesus Christ bless you and your good work Amen. W. A. and S. G.
HOWEVER, THEY SAY A PICTURE IS WORTH A THOUSAND WORDS!!! 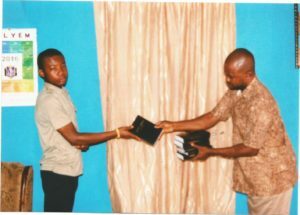 Well, here’s some thankful people showing off their thanks with their new Bibles that they received through our Blind Ministry & your generous Love Gifts. Thanks from ALL of them!!! REMEMBER TO CHECK OUT OUR OTHER NIGERIA LINKS!!! MANY OF US HAVE MORE THAN ONE COPY OF GOD’S WORD!!! What’s worse, is many of us let dust settle on God’s word without even reading it once or twice a year! 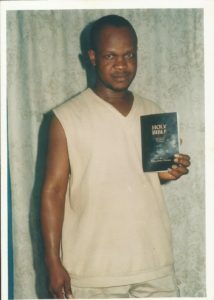 While people in a country like Nigeria would DIE to keep and read God’s Holy Word! Go here to see how you can help to place a Bible in the hands of someone who will REALLY put it to use and NOT let “DUST” get on the Bible!!!! DO A LITTLE MISSIONARY PRAYING!!! Take a look at the prayer requests from Nigeria. Then fall on your face for someone who is really “SUFFERING” for the name of JESUS CHRIST!! !